Marvin Bratke is German architect and designer, currently based in Berlin. He has received his diploma in architecture with a special focus on mobility design top of the semester at Technical University of Munich in June 2011. 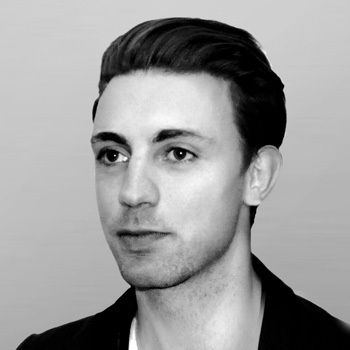 His ongoing research and design ambitions are focused on emergent technologies in architecture and industrial design, the digital methodology relating both professions and their application in performance-orientated, mobile and ecological building systems. Following ten years of collaborative experience in academic, research and professional projects he co-founded BART//BRATKE in 2014. Marvin’s body of work concentrates on projects of various scales and sectors in Germany, Saudi Arabia, China and the Netherlands focusing on architectural, cultural, transportation and art projects as well as digital fabrication techniques and developing parametric tools that assist in generative design. His creations and ideas are greatly influenced by cultural, biological and technological environment with social aspects of 21st century context. His award winning work has been widely published in several journals and exhibited, e.g. at the IAA Frankfurt, at Bauhaus Luftfahrt and Munich Design Week, Hybrid Realities Washington and push.conference. Currently Marvin is collaborating as Design Director at Graft Architects in Berlin. Previously he has been working as Design Architect at LAVA, Senior Designer at MLAUS (Mediterranean Laboratory for Architecture and Urban Strategies), Urban Researcher/Transportation Designer at GIST (German Institute for Science and Technology) and contributing advanced geometry solutions for KERE Architecture. BART//BRATKE is a research platform founded as a network of creative minds working at the intersection between future mobility and architectural research, tested in the fields of dynamic foresight, urban innovation and materialization of future narratives.